My poor children have had enough of me cooking healthy food. It’s not that they don’t gobble it up and appreciate the home cooked meal. It’s just that sometimes the only thing that works on a rainy night in Spring is to order in. Tonight they both begged me not to cook and to order pizza and Caesar salad. This was after packing them a delicious rice bowl for lunch today that they both complained didn’t fill them up. I served them an even better version of this for our Sunday supper. 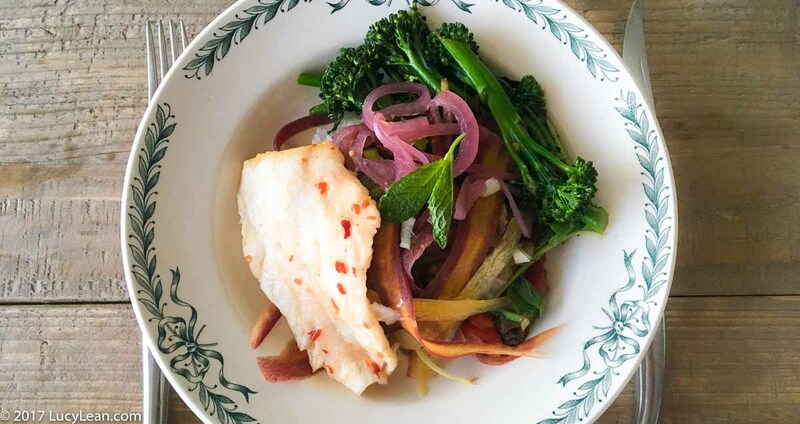 On Sunday I went all out to create a dish that was packed with lean protein, high in nutrients and big on flavor – a sushi rice bowl topped with fish, broccolini, shaved rainbow carrots, mushrooms, red pepper, pink pickled onions, scallions and fresh mint. It was tasty and delicious and super nutritious and I could eat this up every night. Sounds like Minty and Rémy might beg to differ. Preheat the oven to 350 F. Defrost the fish and place in a baking dish. Add a good splash of rice vinegar and mirin and some chilis. Place in the oven for 20 minutes – until fish is opaque, flaky and the liquid is bubbling. Whilst the fish is cooking cook the rice – I use a rice cooker but you can always follow the instructions for cooking in a pan. When the rice is cooked at 2 tablespoons each of rice vinegar and mirin. As the fish and fish are cooking heat the oil in a large frying pan and add the onion. Cook for 2-3 minutes before adding the mushrooms and peppers. Cook for 2 minutes and then add about 2 tablespoons soy sauce and add the broccolini. Cook for 5 minutes. 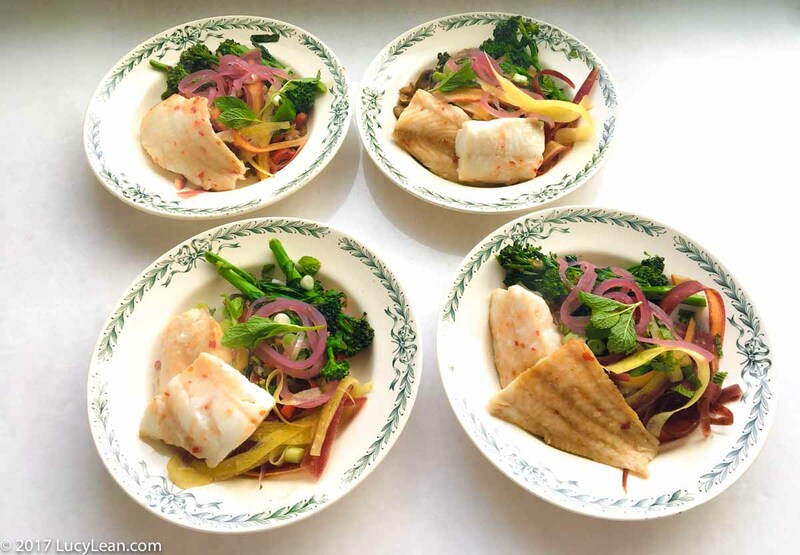 In a large bowl place some rice, the cooked veggies, rainbow carrots, pickled pink onions, scallions, fresh mint – and top with the fish. Serve immediately – Minty likes to add additional Ponzu sauce – Bon appetite!